You may call it a glitch, or maybe a feature deserving an improvement. See, not an actual bug, but something that feels weird. I have the commander view, and I click a file to then drag and drop it to the remote folder. I noticed something about the icon representing the file's extension, and the actual location of the mouse pointer, taking the shape of a forbidden sign as long as we're not in the remote location. The thing is : those two icons can be ridiculously far from each other, till the point we wonder what's this ghost zip-file-format icon (in my case, that was a gif) flying around. See the two combined screenshots I attached. My friendly suggestion, maybe force a maximum distance between the actual mouse pointer and the file-extension-icon's archive ? Or, even better, entirely give up on displaying the flying icon of the file format ? 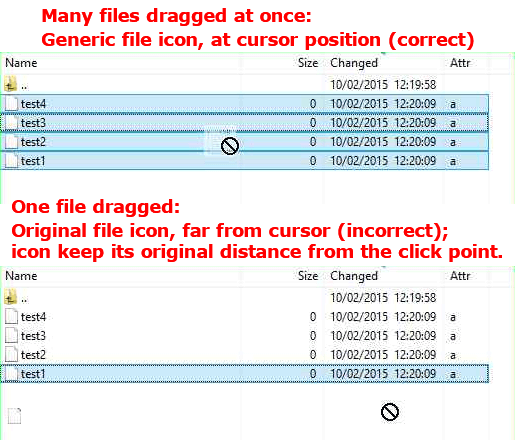 Or instead force the display of the entire file name, and have its end stuck to the location of the mouse pointer ? Thanks for the report. Will take a look. So far, it seems that it works properly when dragging more than one file, however wscp uses one predefined image as a generic icon; when dragging only one file, the initial icon position is exactly where the corresponding icon was on the list -- if you click in a point close to the fileicon, then start dragging, the icon will stay close to the mouse pointer, and vice versa, as reported in this topic. It would definitely be nice, if there was a image representation of dragged items. But I think that no image is better than the broken image that was there currently. So that's why I've removed it. And I keep any improvements for the future. I mean, when many files are dragged the bug reported by oliverfr does not happen. Just by looking at the behavior, it seems something easy to fix (something in the function that sets the position of the icon when only one file is being dragged). The only reason this ugliness survived in WinSCP for all those years is that I personally do not use drag&drop at all.